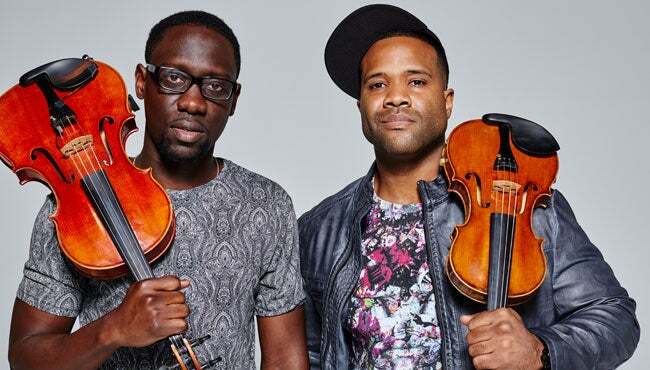 Cincinnati, OH – Hip-hop meets classical violin when the nationally-acclaimed band, Black Violin, makes its much-anticipated return to Cincinnati at Music Hall’s Springer Auditorium on Tuesday, April 16, 2019 at 7:30 PM in an all-new tour, details of which will be announced at a later date. Tickets go on sale Friday, September 28 at 10:00 AM at www.CincinnatiArts.org, (513) 621-ARTS , and the Aronoff Center Ticket Office. A student ticket price of $15 is available in select seating locations. Group discount tickets for 10 or more are available by calling (513) 977-4157. Black Violin has spent the summer working on their upcoming album due out in 2019 and experienced a well-received winter run which included back-to-back sold out performances at The Kennedy Center in Washington, D.C. Earlier in the year, Black Violin was announced as the Turnaround Artist for Mary B. Bethune Elementary School in their hometown of Broward County, FL. Turnaround Arts, a national education program of the John F. Kennedy Center for the Performing Arts, infuses arts into struggling schools to support overall reform efforts. Founded by President Obama’s Committee on the Arts and the Humanities in 2012, the program partners schools with music instrument grants, arts supplies, professional development, and musicals, and pairs each school with an artist to provide mentorship, inspiration, and support for the school’s journey in the program. Turnaround Artists include Elton John, Edward Norton, and Yo-Yo Ma, among other highly-acclaimed members of the arts community. In addition, Black Violin has performed for more than 100,000 students in the past twelve months throughout North America and Europe. The band is endorsed by Yamaha Music and Bose, and has partnered with the National Association for Music Manufacturers (NAMM) to continue their advocacy for accessible music education.